*This post contains affiliate links of my tried-and-tested favorite products, please read my full disclosure here. Do you have dry, brittle, and/or cracked cuticles? Are your cuticles so sharp they could open a letter? Do you cut your cuticles to save embarrassment from your weed-like talons? Your cuticles can be rescued! 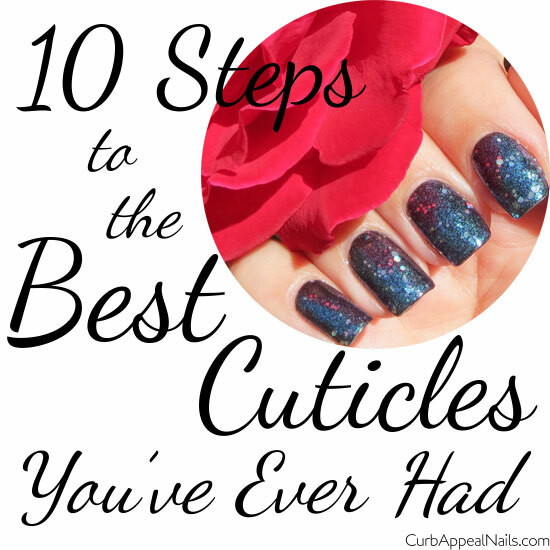 I have listed below 10 steps, divided into 5 simple tips that I use and 5 of my favorite products, which will help to cure your sad cuticles so you can have hands that would make your manicurist proud. 1. Moisturize, moisturize, moisturize! As obvious as it may sound, you are probably not hydrating your cuticles enough. Begin a regimen of applying one of the products I list below at least twice a day; after you wash your face in the morning and before you go to bed at night are great places to start. I also keep at least one of the products I list below in my purse and at my desk at work and at home, that way I always have the opportunity to slather something on. 2. Wash only the palms of your hands with soap. This is a very simple technique that you can start using right now for the regular everyday washing of hands after the bathroom, etc. Washing the tops of your fingers with soap will not only wash off the products that you have just applied but will dry out your cuticles. 3. Use an orange stick to push back your cuticles. What is an orange stick you ask? It is a small piece of cylindrically-shaped wood (which is thought to have come from wood of an orange tree, hence the name) that has been tapered at both ends, either to a point or to a flat wedge. The shape of the ends and the natural wood can gently push back your cuticles and clean under your fingernails, unlike metal scrapers which can be very sharp and can easily damage your nails, skin around your nails, and cuticles. 4. Wear moisturizing gloves to bed at night. If I'm feeling extra dry, I wear Aquasentials Moisturizing Gloves on my hands and Earth Therapeutics Moisture Foot Socks on my feet. Or use one of the heavier products below, coat your tips and go to bed with regular gloves or socks. You will wake up to the pleasant surprise of softer skin and cuticles. 5. Absolutely DO NOT cut your cuticles. If any bad habit is worthy of stopping, it is the nipping of your cuticles. Not even your manicurist is allowed. (If they start to do it, smack the back of their hand and stop them immediately!) Your cuticles are there to protect your nails, and just like any other part of your body's skin, develops a protective scar when it gets injured, to shield it from further injury. If you repeatedly nip your cuticles that will only viciously cycle into harder and harder cuticles every time you cut, not to mention they may also become infected. I know it seems like your thick and hard cuticles will never go away unless you cut them off but THEY WILL GET BETTER OVER TIME! Whenever you get the urge to nip, use one of the products I list below instead, and in time, they will get better. This is hands down (har har) my favorite hand lotion. The reason why I like it so much is because it applies very light and slippery, then absorbs completely to leave your hands smooth, silky and without residue. Don't you hate it when you apply lotion just to have it smear all over you keyboard and phone? Not with Avojuice. Now this is not for extremely chapped hands but if you're like me and have sweaty palms that get choked by a normal lotion, Avojuice is the solution. I keep a giant pump bottle on my desk at work and a mini bottle in my purse and use it after every handwashing. Con: I've found some of the scents to be not-so-pleasant to me, but I have fallen in love with Hibiscus Blossom and Mango. This is also on my desk at work. It comes in a handy little tin and is perfect for your pocket or purse. There are 2 sizes, 0.06 oz and 0.03 oz, I have a couple of the smaller ones and they are about the size of a silver dollar. The name is a little misleading because it's more of a harder balm than a cream, like chapstick for your cuticles! It has a light and pleasant lemon scent and is easy to apply with your fingers. I like to put this over cuticle oils to seal them in. Con: If you have long nails it may be hard to open the tin and getting this stuff out, unless you don't mind scraping some out with them! This is a cult favorite in the nail world. It comes in a 1.5 oz. container and a little goes a long way, so it will last you (well at least last me) WELL past the 14-month expiration date. Yes this product actually has a listed expiration because LUSH is known for making fresh handmade cosmetics. The consistency is a thick cream which is great for other dry areas of your body like elbows and heels. Con: The lemon scent can be off-putting to some, I have even heard that it smells like "lemony gasoline". At first it was strong to me so I only wore it at night but now I quite like it and I even use it religiously as lip balm. ***This product retails for $16.95 USD so please don't buy from my overpriced link unless you don't have a brick and mortar store nearby! This does exactly what the name says: instantly removes your cuticles in about 15 seconds. It works great to dissolve all that buildup of not only cuticle skin, but can also help disintegrate calluses. After letting the gel formula sit, gently push back the cuticles with an orange stick, then wash off the product with soap and water. VOILA! Neat and clean cuticles! This is by far, my #1 FAVORITE cuticle and nail oil of ALL TIME! It comes in an awesome brush pen or a larger dropper bottle. The main ingredient is Jojoba Wax Ester, which according to their website, is the smallest oil molecule that can actually penetrate your nail plate, which makes it the only effective nail oil. I remember first reading about this product on Lucy's Stash here, When I read that her long and always perfect nails didn't have a break after 4 months of using the product I was sold. And boy, am I glad I found this because my nails have never been so long and flexible, and my cuticles so soft and supple. I use this stuff multiple times a day religiously and freak out if I can't find it. Con: Opening the pen to refill it can be a big pain but it is possible and worth it! I would love to hear about your favorite tips and products so please let me know in the comments below!